Minister for Information and Broadcasting Fawad Chaudhry has warned that the government would not turn a blind eye to, nor forget, the inciteful speeches made during recent protests against the acquittal of Asia Bibi . Talking to media in Karachi on Sunday, he said the impression that this government is weak will be removed as we take further action. He said although the situation was controlled but the way the Constitution, the people, the political leadership, the military and judiciary were held in contempt, it is unlikely that we will forgive it. Fawad Chaudry said all involved persons would be brought to justice. Replying to a question,he said for the first time Sindh came into a national politics from ethnic politics and people of the province expressed their trust in Pakistan Tehreek-e-Insaaf and Prime Minister Imran Khan. Replying to a question,the Information Minister said there is no need of Governor Rule in Sindh. He said the infrastructure of the province including Karachi will be further improved. 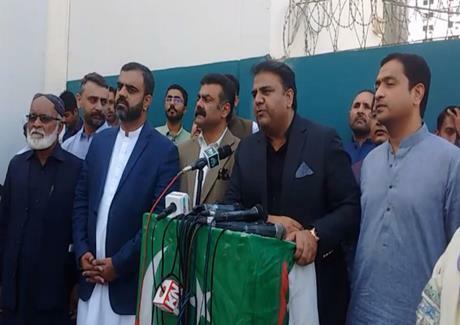 Fawad Chaudhry said federal government with the cooperation of UAE will plant a desalination plant in Karachi to overcome the situation of shortage of water. He said all the promises made by Pakistan Tehreek-e-Insaaf will be fulfilled.